Acute kidney injury (AKI) is a common type of kidney disorder with high morbidity and mortality worldwide. Patients from low-resource regions are more prone to acute kidney injuries. The incidence of acute kidney injuries varies greatly in Asia due to significant variation in climate, geographical attributes, ethnic groups and socioeconomic status. The global continuous renal replacement therapy market was valued at US$ US$ 743 Mn in terms of value in 2016, according to a latest research by Future Market Insights (FMI). The report on continuous renal replacement therapy further projects significant growth potential with average year-on-year growth rate of 7.7% through 2027. Continuous renal replacement therapy is conducted for blood purification in patients suffering from acute kidney injury who unable to withstand rapid fluid and electrolyte exchange of conventional hemodialysis. Continuous renal replacement therapy involves the removal of blood from the arterial lumen catheter through the peristaltic movement and pushing it through a hemofilter before getting pumped into a patient via a venous lumen of catheter. Rising incidence of acute kidney injuries, multiple organ failure and other renal injuries had increased the demand for dialysis sessions. Numerous advantages of continuous renal replacement therapy over the conventional dialysis procedure is a primary factor driving the adoption of continuous renal replacement therapy. Conventional dialysis systems are operated manually and all associated tasks are solely controlled by the user or caregiver. However, technological advancements in currently available continuous renal replacement systems allows the automatic management of disease parameters. Hence, most of the problems are being directly handled by automated digital machines, which is not possible in case of conventional systems, thus reducing the labour cost. To expand their commercial footprint across the globe, several manufacturers of continuous renal replacement therapy are focusing on introducing new technologies and upgrading their existing products along with simultaneous focus on strategic alliances for the sale and promotion of their products. For instance, in 2015, Fresenius Medical Care AG & Co. KGaA launched multi Filtrate PRO, a therapy system for continuous renal replacement therapy for the treatment of acute kidney failure in critically ill patients at intensive care units. Innovations in extracorporeal technologies will play a critical role in the long-term sustainability of continuous renal replacement therapy devices. The advent of continuous renal replacement therapy devices will eventually attract a new patient base. For instance, in September 2017, Baxter International Inc. launched 3-In-1 oXiris Set for sepsis management protocols & continuous renal replacement therapy, which was previously indicated only for continuous renal replacement therapy. The commercialisation of such multimodal devices is expected to enhance the ROI for hospitals. The introduction of novel autonomous CRRT devices will marginally reduce physician intervention and the cost of treatments in intensive care units. The intuitive platform with touch screen and step-by-step automated instructions promotes ease of use during procedures. Companies are investing in future growth by expanding their healthcare services businesses through acquisitions as well as the purchase of expertise and relevant technologies in the area of research and development. In 2016, Fresenius Medical Care spent US$1.3 Bn on capital expenditures, acquisitions and the purchase of intangible assets minus income from divestments. The majority of capital expenditures were used for equipping existing & new clinics, preserving & expanding production capacity, primarily in North America, Germany, Asia Pacific and France, as well as for dialysis machines made available to customers and for care coordination. FMI segmented the global continuous renal replacement therapy market into product type, end user & regions. In terms of revenue, the consumables segment is expected to hold a substantial market share over the forecast period. The segment is expected to exhibit a significant CAGR of 8.5% over the forecast period. 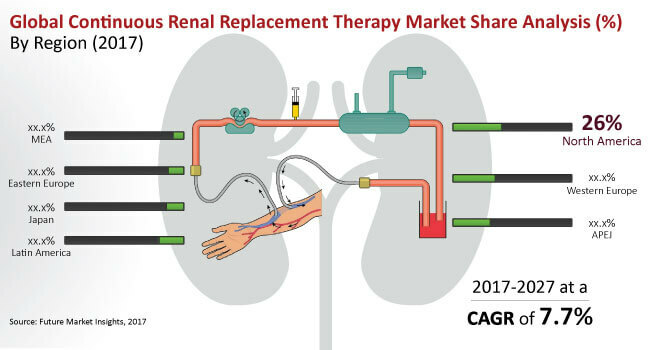 FMI’s report covers some of the key companies operating in the continuous renal replacement therapy market, which include Fresenius Medical Care AG & Co. KGaA; Baxter International Inc.; B. Braun Melsungen AG; Medica SpA, Nikkiso Co., Ltd.; Nipro corp.; Toray Medical Co., Ltd.; NxStage Medical, Inc.; Asahi Kasei Corp. and Medtronic plc.